Metacam is a non-steroidal anti-inflammatory drug, a painkiller used to treat surgical pain in guinea pigs. Where can I buy Metacam? 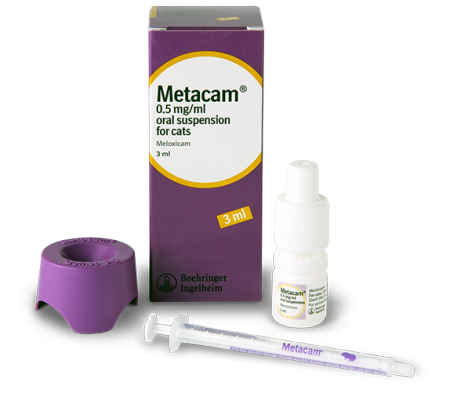 Metacam is only available with a prescription from your veterinary surgeon. Metacam relieves pain associated with surgery, helping your guinea pig stay comfortable and pain free. Metacam oral suspension is administered directly into your guinea pig’s mouth. Use the dosing dish and syringe your vet has supplied, these are specifically designed for use in guinea pigs. Give the dose that your vet prescribes. What is the dose of Metacam? Your vet will prescribe the correct dose that your guinea pig will need. Follow your vet’s advice on how to give Metacam and how much to give. What is the flavouring in Metacam? Metacam oral suspension has a honey flavour, which most guinea pigs love. How long will my guinea pig require treatment with Metacam? Your vet will advise how long the treatment course needs to be following surgery. What if I forget a dose of Metacam? If you forget a dose, do not give an extra or larger dose, simply give your guinea pig the usual dose at the next scheduled time. This may mean missing a daily dose. Does Metacam have any side effects? Normally, guinea pigs tolerate Metacam very well. If your guinea pig becomes unwell or you are worried at all, you should contact your veterinary practice immediately. You should stop giving Metacam until your vet advises that you can continue using it. This is because in some cases, Metacam and other medicines like it can cause side effects, so your vet needs to ensure any changes that develop in your guinea pig are not related to the medicine they are taking. What sizes of Metacam are available? Metacam oral suspension for guinea pigs is available in 3 ml, 15 ml and 30 ml bottles. What if I accidentally give too much Metacam or another pet eats the Metacam? If you think your guinea pig has had too much Metacam (an overdose), or another pet has taken it when it wasn’t prescribed for them, you should immediately contact your veterinary practice for advice. Tell the veterinary surgeon the full details of how much was swallowed and when. I have lost my Metacam guinea pig dosing syringe/dish, how can I get a replacement one? Your vet will be able to supply you with a new Metacam guinea pig dosing syringe and dish; ask them to phone Boehringer Ingelheim to request additional dosing syringes or dishes. I have been given Metacam oral suspension for cats - is this safe for my guinea pig? Metacam 0.5 mg/ml oral suspension for cats is also licensed for guinea pigs. It is important that you only use the dish and syringe provided by your vet for dosing guinea pigs. Please do not use the cat syringe from the Metacam box if it hasn’t already been removed by your vet. The cat syringe is calibrated to provide a dose specific to cats only. The Metacam box provided to you may not mention guinea pigs but be assured Metacam oral suspension for cats is fully licensed to be used in guinea pigs.